Metro Tasmania has welcomed seven new buses to its fleet in the lead up to the State Election. The State Government has invested almost $3 million to buy the seven state-of-the-art buses, as part of Metro’s ongoing fleet upgrade. Of the seven new buses, four have arrived and two have entered service and he remaining three will arrive by the end of the February. All seven buses will be in service by mid-March. 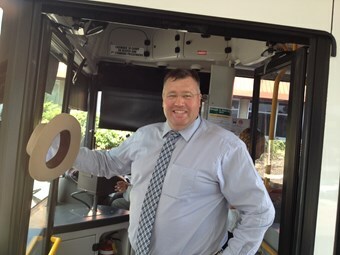 Sustainable Transport Minister Craig Farrell says public transport is a vital community service. "It links people to jobs, education and a host of important services," he says. "Under my watch, public transport will be about connecting Tasmanians to the things that matter in life – jobs, school, services, and each other. Farrell says Labor will be announcing innovative policies during the election campaign, to make Metro even more useful and relevant for Tasmanians leading busy lives. The Tasmanian State Election is to be held on March 15. Metro’s Acting Chief Executive Officer Anthony James says the organisation has now bought 26 new buses in the past four years, under its modernization program. "Metro’s fleet now stands at 217, so the new buses bought over the past four years represent about 12 per cent of the total fleet," James says. "The new buses are quieter and more comfortable for passengers, and have low-emission engines."